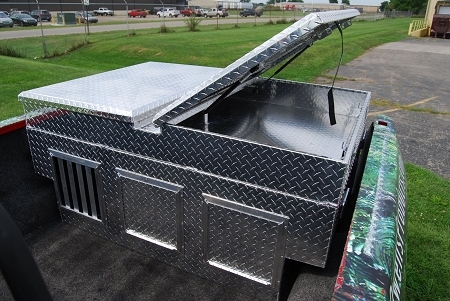 Transport your dogs from home to the field in Owens Products' Hunter Series Triple-Compartment Dog Box with Dual-Compartment Top Storage. Rugged diamond-tread aluminum construction looks great and delivers weather-resistant performance. 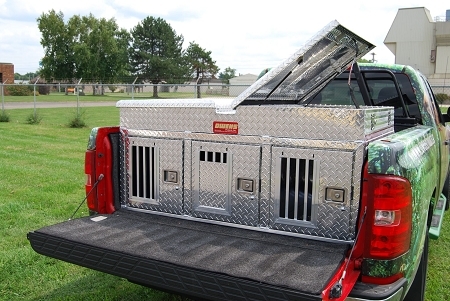 Dual lined dog compartments have lockable slam-latch doors with storm covers to keep your four-legged friends dry. Generous air vents allow maximum airflow, keeping your furry hunting partners comfortable. Two large storage compartments on top house all your collars, dog food, electronics and other hunting gear with room to spare. Made in USA. 40"L x 58"W x 26"H.
Dog compartments: 19"H x 19.25"W x 39"D.
Storage: 6"H x 38"W x 40"D.